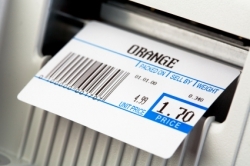 Color label printing continues to grow in demand. Color is useful for drawing attention to prices, markdowns, or promotions at the retail level, and can help distinguish between customers, shipments, the day of the week, and define where cartons get placed at the industrial level. Here we will briefly outline the history of color label printers, and discuss some different options to consider before you buy one. Today almost every office has a full color ink jet or laser printer. While these of course are sheet fed printers, most label printers are configured to print on LABEL ROLLS. The advantage of rolls labels are that there are numerous label dispensing and application options, whereas sheet labels require a lot of labor to peel from the sheets. Roll labels also offer numerous material and adhesive options, whereas ink jet printers print best on ink jet receptive papers, and laser on laser materials. I remember the first color roll printer I saw at a trade show in the early 90’s: Toshiba’s TEC division offered a $12,500 full color thermal transfer printer. The resolution was 300 dots per inch, and its print speed was fairly quick. These units were priced somewhat high for small companies, and required extra maintenance and servicing on its 4 printheads. Each printhead would run a different color ribbon—so of course these units also had to house and control tension on 4 ribbons at the same time. TEC discontinued these printers a few years ago, but you can still buy used, and re-furbished units. Then around the mid 1990’s Datamax released a unit that utilized PANELLED RIBBONS. Each ribbon had about an inch or two of cyan, followed by magenta, followed by yellow, then black. So if someone was required to print a 2 color label, they would waste 2 colors of the paneled ribbons. I remember looking at a couple of these for a pharmaceutical company, but in the end the ribbons did not make sense for their application. Then around the same time, VIP Color offered their VP2020 which utilized separate magenta, cyan, yellow, and black ink cartridges, and printed at a high resolution. The printer wasn’t too slow (ink jet in general is slow), and was offered for around $7,500. The issue for some was that it was an ink jet printer, and was not the best fit for running certain durable materials. This unit was recently discontinued. Then around 2000 Primera (an HP offshoot) released their $2495 LX800 ink jet roll label printer. I was thrilled at the time, but in the end the unit was simply too slow, and its utilization of tri-color ink cartridges was ridiculous. For example, if a company printed mainly in black but required a red logo, the other colors in the CMY cartridge would go to waste. Finally, for higher volume production that required non-ink jet roll to roll, The Degrava laser, digital roll printer was offered. This had a price tag in the $20,000 range, and was more suitable for larger production runs. The downside though was that the heat from the unit would prevent the unit from being able to print on polypro films—quite a common label material, for high runs. Today, new models and color printing technologies are being released on a regular basis. There is a technology available that allows monochrome direct thermal printers to print in colors (see the article: Color Printing with Monochrome Color Printers?). Most of the competing ink jet units are priced to sell, some starting at $1295, and averaging $2995. The manufacturers finally realized that separate and larger capacity ink jet cartridges are the only way to go. 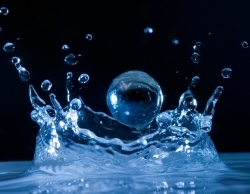 While ink jet printing on some coated papers offers some water and moisture resistance, its durability still pales in comparison with thermal transfer resin ribbons and laser methods. Even when we consider that there are now laminating equipment options for some ink jets models, most small businesses really don’t want to get into the added expense and maintenance. For example, one laminator I priced was in the $15,000 range—and the printer itself was only $3500. However as we move along, I anticipate the ink jet inks to become as durable as the other methods. As mentioned prior, TEC (Toshiba) has discontinued their 4 color thermal transfer model. I am not aware of any plans to release a new model. The big players such as Datamax, Sato and Zebra, do not offer full color options, probably for good reason. They have most likely stayed away from developing and releasing multi printhead models because of limited selling opportunities, the required enhanced level of maintenance and technical support, and/or the recent influx of user-friendly ink jet and laser color options. 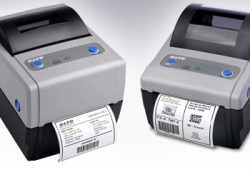 Most end users simply want to print labels, without a lot of set-up or maintenance hassles. There is a company that still offers some thermal transfer color roll printers; however, their thermal transfer models are about a decade old, whereas all of their new product releases are ink-jet and laser. I receive phone calls on a regular basis from companies who purchased one of their color printers, only to learn that they are being held hostage on the media because the ribbons or inner cores are proprietary. While almost all printer companies sell though distribution networks, this particular outfit only sells direct, and makes it difficult for their customers to source labels and media elsewhere. Imagine buying a new car and being told new brakes, tires, and repairs can only be purchased through the manufacturer! &amp;nbsp;For the past few years, I have been taking a closer look at the newer Memjet ink technology. I was introduced to these at an East Pack show in Philadelphia. The units seemed impressive. They offer BOTH a sheet fed and a roll fed color printer, and the print speed is fantastic at up to 12 inches per second. Unlike traditional ink jet technology, Memjet printheads are page width and do not need to scan back and forth. It incorporates over 70,000 ink nozzles on their printheads, resulting in high resolution and fast print speeds. Each company really should access their individual color label printing requirements, and try to look at the whole picture. 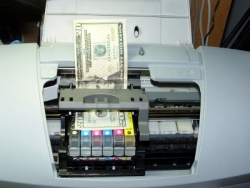 In a lot of cases the least expensive printer isn’t the best option; typically the media cost is higher. How important is print speed? And the print method also needs to be considered: ink jet may not be the best for some companies, whereas laser may be the way to go. Regardless of which printer method and model is chosen, ease of use and reliability are essential! It is also important to have the ability to gage, at least ballpark, what the media cost is per label, and to make sure that the printer media (labels and ribbons, or labels and ink cartridges) can be sourced and serviced from more than one supplier.